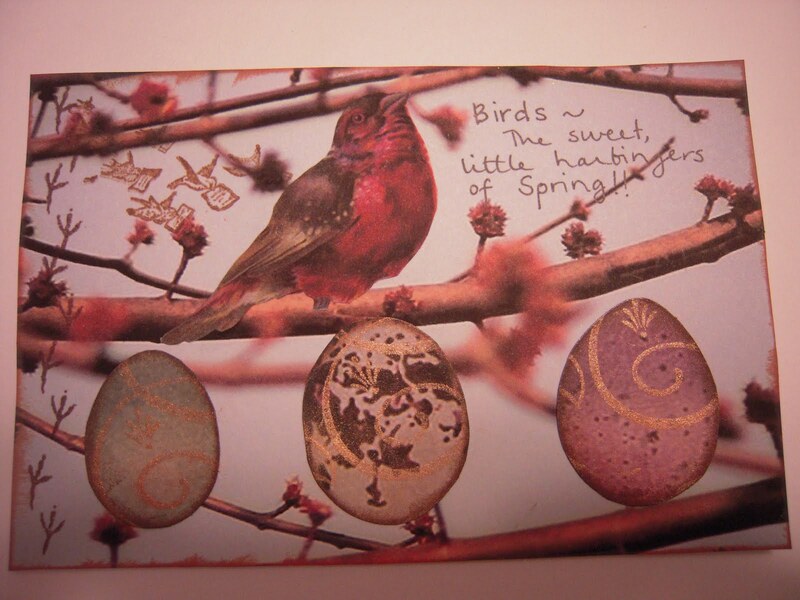 My first altered-book Round Robin! I'm so excited! 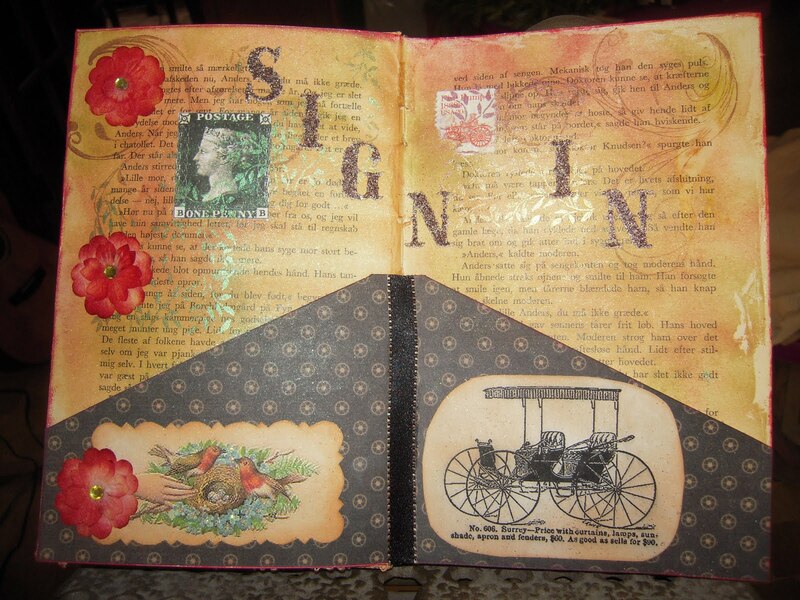 I just started working in my own altered-book to be included in an altered-book Round Robin! Five other artists have signed on for this adventure. So, that means that each of our books goes to one of us to work in. Then, we send it off to the next person on the list to do the same. In about six months (hopefully less! ), we'll get our books back, now as works of art! I've only done some techniques in a book before... I've never actually started working on one as a stand-alone altered book. So, there are many firsts here for me. I've also never done a Round Robin. It was a complete leap of faith....that I could figure out how to create the look that I'm after and that my work would be at all comparable to the other artists' work. Well, that's yet to be seen. But, I've already learned quite a bit, just doing what you see here. I battle with myself about creating the time to play with my supplies. 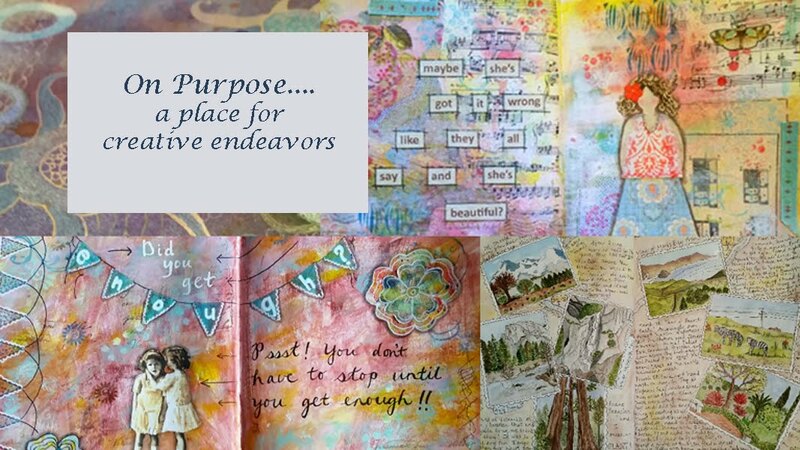 I've had accomplished altered/mixed-media artists tell me that "you have to make the time.. and just let yourself play!" It's so true! You can see how it's done, in a book, or a tutorial, but it's not the same as playing with those supplies yourself. Everyone's touch with the paintbrush is different. Some people don't even use paint! So, you really do have to figure out what works best for you... and what your "style" is. I'm still figuring that out. But, I know what I like, when I look at other artists' work. So, the first picture, above, that says, "Victoriana".... that's the theme of my book. Anything Victorian. In a Round Robin, you can either have a theme for the whole thing... everyone agrees on the same thing... so, all books have the same theme. Or, (Oh, my gosh! I forgot to put my salmon into the oven!!!) each "player" (as we're called), chooses their own theme for their own book. So, when you get their book, you work in it with that theme in mind. You can't really capture the depth of pictures like these in photos. The woman on the first page, in the corset, is actually raised off the page. She has a "shadow-self" underneath her. :) I also have more work to do on that page, but I ran out of time. I was already three days late sending mine out, so decided to finish that when I get my book back, later. On the sign-in page, you can either just have space on the page to sign-in or you can have "tags"... (or any other number of ways to do it), but I chose tags. 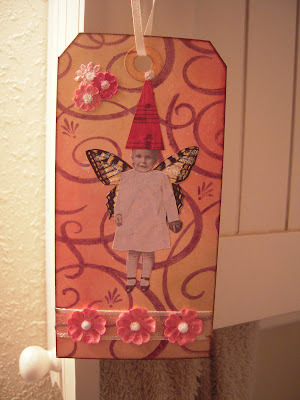 I love making these little tags! They're just office tags... but, they're a great way to practice techniques because they're small. It's not a big investment in time (well, I take that back. It all takes me a long time!) and you don't have to put a bunch of stuff on them to make them look great! Anyway, the people who work on your book choose a tag and put their name, where they live, and whatever else you request on the back of them. So, this last picture is just the tags, alone. All the coloring on them is Ranger Distressing Inks. They are so great to play with!! I love them! 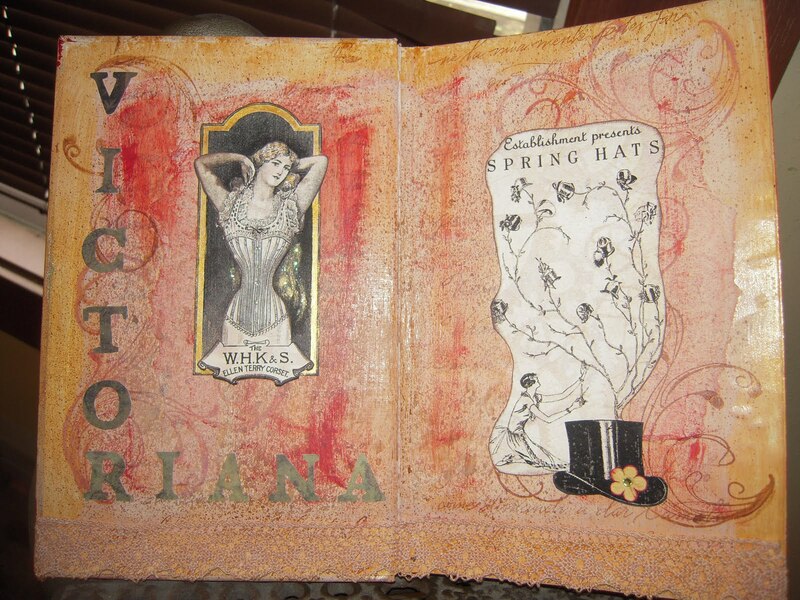 The coloring on the book pages is either glazing or acrylic paint. The first page is paint... the rest are glazed. So, I'm now working on a book from a woman in Minnesota. Her theme is There's No Place Like Home. I won't divulge what I'm going to do with that, until later, because I don't want her to know, ahead of time, just in case she looks at my blog! :) We also have players from Arkansas, Maryland, Oregon - a friend of mine that lives near me - and British Columbia. Most of us have never done a Round Robin before, so that makes me feel better. :) I'm not the only one! How did I miss this little one?? Here's the laptop case that I made for my sister. 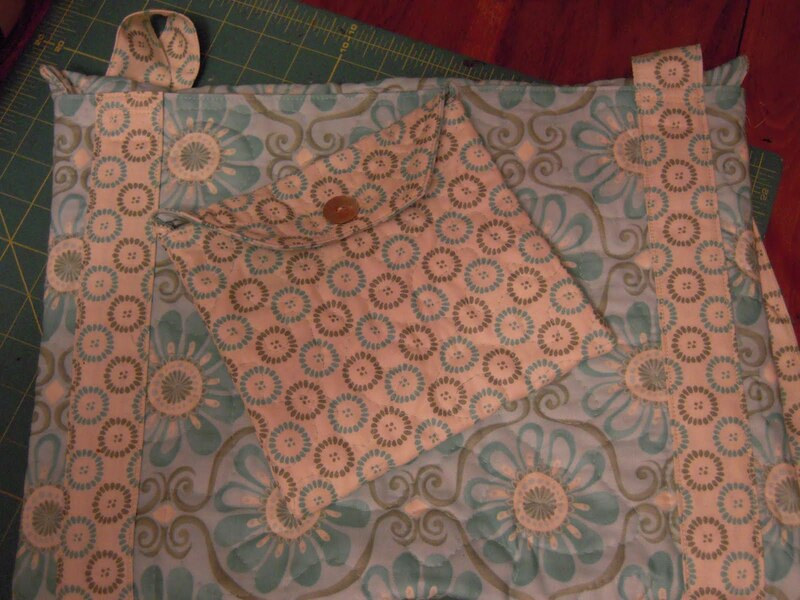 This shows the power-cord bag that goes with it. A friend made me one of these a couple of years ago and I *love* it!! I've been making them ever since, for friends and family. Here are some tags I've done in the last few weeks. 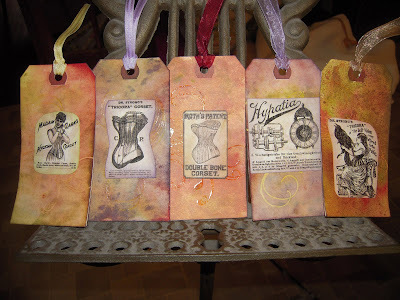 I love playing with tags...they're just plain, ol' office tags....so, they're not a huge commitment in time and/or effort (although anything I do like this takes me probably at least 1.5 hrs., which brings me to another topic...later) and they're inexpensive! So, it's not a big investment, any way you look at it. But, they are so sweet! I did several of them for friends and family, for Valentine's Day...that's really when I got going on them. Since then, I've done one "just because" and a couple to go on birthday gifts, instead of a card. I will show those last three, here. This first one was for an altered-books, online friend. She is an altered-artist who lost her supplies in a n apartment fire a few years ago. So, I, very secretively, asked some of the people on the altered books list if they'd want to help me out and send her some surprise supplies and goodies. There were seven or eight of us that participated and the recipient was overjoyed by our RAK. It felt great to be able to help out in that way. A pretty simple thing, really, yet so beneficial. 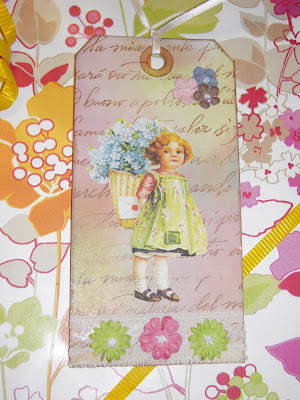 So, this was a tag that I made, just to add to the mix, with a little note on the back. 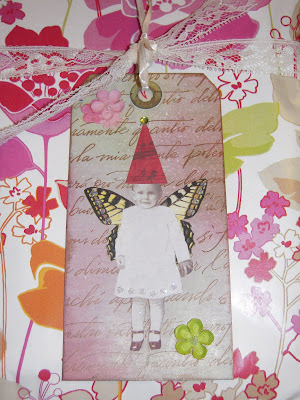 Just like these tags.... pretty simple, but beautiful and so rewarding! Which brings me to the part about taking the time to do them. I'm a firm believer in having hobbies. I think they're really important, on many levels. But, one of the things is that they are meditative.... and calming, for the most part. When you are so intent and focussed on your project, you don't think about anything else. 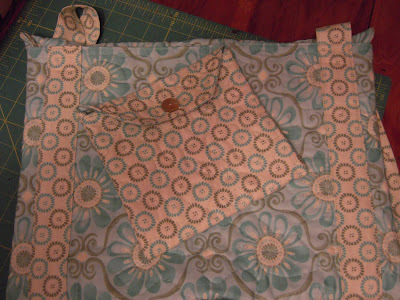 With sewing, it's pretty straight-forward... you go through the steps as you're supposed to, when you're supposed to. So, for me, anyway, if I'm making a baby quilt, for instance, as a gift, I spend a lot of time thinking about the person/family that it's going to... and, of course, the new, little baby that will get to keep that quilt forever, I hope! With altered art, it's a little different, probably because I'm so new to it. I'm constantly thinking about which colors I should use, which elements should be added, etc.... so, it doesn't leave much time for the mind to wander... but, that's a good thing!! I'm telling you, it's cheaper than therapy!! You can only really think about the project at hand. That's why it's so beneficial in that way. When I was taking a watercolor class, several years ago, a 76 yr. old woman, who was also in the class, told me, "It's better than counselling! For two hours I don't think about *anything* except what I'm doing!" It's so true. I can't say enough about the benefits of having hobbies.... and especially creative hobbies. 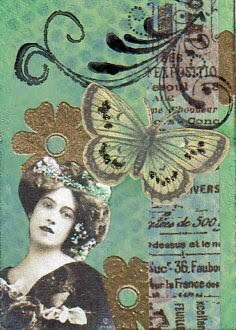 Here's an altered art piece I just did a couple of weeks ago. 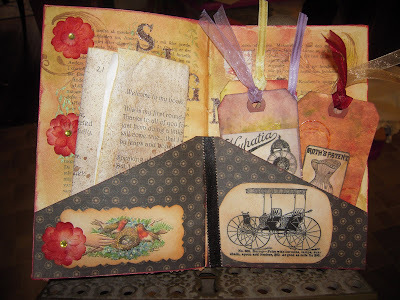 A woman on the Altered Books list that I run sent out some RAK mail-art pieces to several of us. So, this was my "thank you" to her, for that. Ah, there are signs of Spring here! Primroses blooming; Croccus' already bloomed, although I noticed on my walk yesterday that there are still some blooming in other parts of town. Lovely. I've got Tulips up about 5", Daffodils up a few... and little, tiny Daffodils that are just about to bloom!! They only get about 5" tall and their blooms are only about 5/8" across, I think. I'll have to take a picture of them. I decided it's getting to be that time of year when I need to carry my camera with me on my walks/runs.....beautiful things are starting to happen out in the world!